The Scottish Vocational Qualification (SVQ) in Food and Drink Operations (Bakery Skills) at SCQF level 6 allows candidates to demonstrate competence in job-related skills in their particular area of work and expertise. This qualification covers areas such as health, safety and environmental systems; promoting and evaluating quality in the production of specialist bakery goods; managing and measuring production performance; and ensuring continuous improvement in food and drink operations. 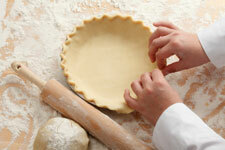 Developed by the National Skills Academy for Food and Drink (NSAFD) — the sector skills council for the food and drink manufacturing sector — the SVQ in Food and Drink Operations qualification is awarded by SQA in partnership with NSAFD and/or the Scottish Federation of Meat Traders Association (SFMTA), and/or Scottish Bakers. This SVQ must be assessed in the workplace, and is therefore only suitable for individuals employed in the food industry. This qualification is available through employers, further education institutions and training providers. Upon successful completion, learners will gain an internationally recognised qualification, which guarantees that they have the skills, knowledge, and abilities required to carry out their role successfully. Employers will also benefit from their employees being proficient. As assessment is carried out in the workplace; this minimises any time learners would need to be away from their work. Candidates can progress to a range of vocational qualifications and to higher education. The achievement of other qualifications within the food and drink suite may contribute towards the successful completion of this award. Candidates should be in a job or placement where they are carrying out relevant tasks and responsibilities that allow them to gather the required evidence. No prior qualifications are required to undertake this qualification, although experience in and/or knowledge of the subject would be an advantage. The SVQ in Food and Drink Operations (Bakery Skills) at SCQF level 6 consists of two mandatory units and six optional units. This qualification is now in its lapsing period and will finish on 31 August 2022. The qualification will be deleted from the relevant catalogue. The qualification’s content and delivery tools will remain on SQA’s website until 31 August 2022, after which point they will be removed and archived. No new centres may be approved to offer the qualification. No candidates can be entered for the qualification. Centres should ensure that candidates complete the qualification and that results are submitted to SQA before 31 August 2022. Centres/candidates undertaking these Courses should also refer to the full National Occupational Standards for information relating to the overview and scope. GG62 23 SVQ 3 in Food and Drink Operations at SCQF level 6 is jointly awarded with Scottish Bakers. This SVQ is a mandatory component in the Level 2 Food and Drink Operations Modern Apprenticeship.